Submissions are closed. Thank you for submitting. Sharing is one of the humanity’s most basic traits; we intrinsically recognize the benefits of pooling resources within a community in order take advantage of varied abilities and access in order to fulfill needs. Sharing is the key driver behind civilization’s move towards collective living – first in small settlements and eventually in megalopoleis. The impact of sharing goes beyond simply satisfying the necessities for survival and extends itself into the social and cultural dimensions of our communities. In constructing an urban commons, composed of collectively managed and shared resources, we shape our physical, social, and cultural environments to achieve some degree of shareabilty – whether of goods, services, or experiences. These historic and evolved cultural roots ensure that sharing is inevitably part of our daily lives. Yet, its central role in how we organize and manage our cities is increasingly threatened. Specifically, the resources previously contained within the commons are slipping into privatized forms of management. Commodifying elements of the public realm, such as energy, space, water, transportation and education, among others, has fragmented the commons and led to major, now too familiar, issues of injustice and inequality. Within a context of increased emphasis on the individual and privatization of the commons, sharing holds much promise for re-evaluating our economic, political, and social relations to equitably distribute resources and services at the scale of both the individual and the collective. The prevalence of the sharing economy in cultural discourse has reconfirmed many of the benefits of collectivity by readdressing how we think about time, space, and excess. Yet, its deep connection with commerce prevents us from focusing on a holistic sharing practice that goes beyond economic transactions to include socio-political activities. Further, there has been little critical reflection on what Rebecca Solnit has termed the ‘Sharecropping Economy’ to understand how the commons is transforming with the convergence of physical and virtual space. Bracket 5 will examine the growing potential for sharing today—from innovative technologies to gritty resourcefulness. We recognize that sharing is not easy — it requires compromise, negotiation, inconvenience, and patience. Can the challenges of sharing be designed for? How have recent design projects found innovative ways to share space, time, or resources? What types of spaces and conditions can foster contemporary models of sharing? Can architecture serve as a mediator for more effective sharing? What are the appropriate scales to share? How can sharing engage issues of equity and politics? 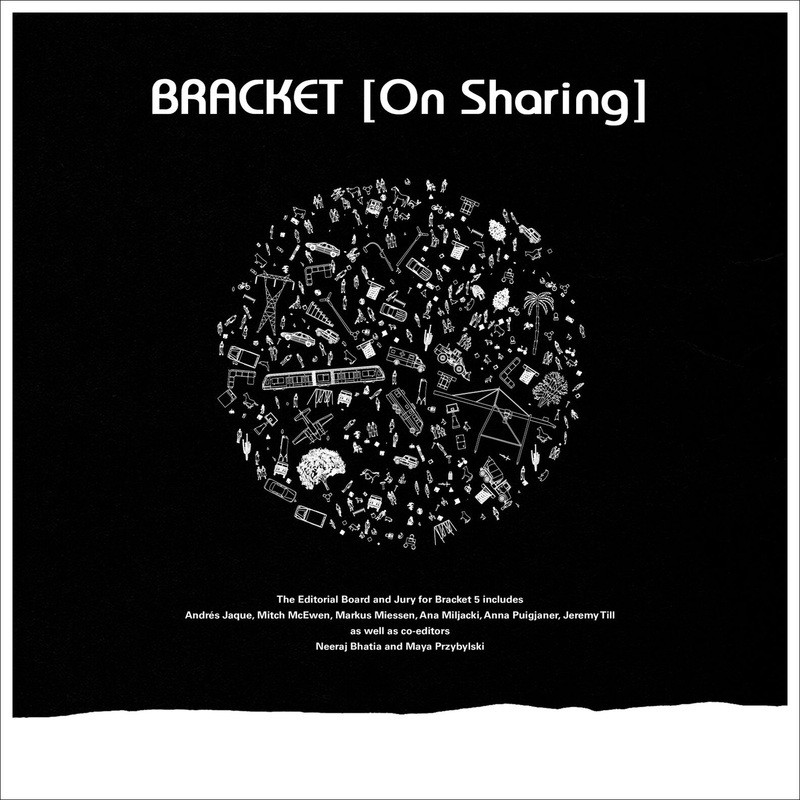 Bracket 5 suggests that sharing needs to be re-learned today. We ask how can the design of our environments encourage new approaches to sharing that question our social, economic, and governmental practices. Submissions should be project-based or article-based. — Final article-based submissions should range in length from 2500 to 3500 words and be formatted in the Chicago Manual of Style with all sources clearly documented. It is important that papers take a position, and clearly define their terms in relation to the theme [on Sharing]. Papers that do not clearly address, question, and respond to the theme will not be considered. Supplementary images are encouraged but optional. For the first phase a 500-word abstract and article outline is required. — Project-based submission should have accompanying text no longer than 500 words with 6-8 jpeg images no larger than 1mb each. Web URLs to audio-visual media can be included in the text. — Authors and designers should ensure, that if selected, high resolution, publication quality, images are available. Authors are allowed, at the selection stage, to submit interactive, audio-visual media, which will be linked to the online presence of Bracket. — All authors and designers must have rights for all images submitted for publication, though this is not required for this first round. — Administration Entry Fee of $15.00 USD is used to cover Jurying, Editing, and Printing of the book. Bracket is a not for profit organization, and editors work on the project without remuneration. Hi there, should the project based, and article based submission boxes be different, I don't see a way of uploading the article submission. How do we upload the final article? I am pleased that you have shared this image here. There's some cool stuff in this image that will help me out with my https://www.topdissertations.org/ultius-review/ work right now. I know that some people may think it's not the best thing to do, but I disagree with them. It really a nice submission of yours. http://www.onedollarwebhostings.com/godaddy-1-dollar-domain-registration.html is the best service provided by any host. When is the next date for the submission? I should have my submitted my entry. Thank you for helping people get the information they need. Great stuff as usual. Keep up the great work! Check out puzzle">https://games.lol/puzzle/">puzzle games for pc. Thank you for helping people get the information they need. Great stuff as usual. Keep up the great work! Check out https://games.lol/puzzle/. You are having a beautiful site which shares useful articles to the audience. The articles are of higher standard and relevant topics worldattestation.com. The main advantage of using your site is, finding the topic in the simplest format in a detailed manner. Thank you for sharing so much valuable information! You have such a beautiful site and also your article is beautifully written.